The World's Leading Guitar Builder Since 1946. Save on Teles, Strats, and much more. • UPC: 885978821594. Its smooth feel and growly midrange, tempered with a bit of treble bite, made it a hero in recording sessions around the globe. • Color: 3-Color Sunburst. The sleek "'70s U"-shaped neck profile and 9.5"-radius fingerboard combine for a comfortably agile playing feel. Gig bag will be included. • UPC: 885978724277. • Body: Alder. Without the Fender Precision Bass, the original electric bass, dance floors everywhere would be empty. The -golden '63 P Bass neck profile feels just right nestled in your hand, becoming one with you, while the narrow-tall frets provide a familiar playing feel and perfect intonation. Black Block Inlay & Black Neck Binding. 45.5mm Nut Width / 3.4T. 2-Ways Trussrod. 19mm Spacing. The Ibanez SR805 5-String Bass Guitar delivers the ultimate stage presence thanks to its mahogany body and stunning poplar burl top. Players will love its smooth, elegant curves and single cutaway design, offering the perfect comfort and flexibility for a range of playing styles. An extended neck joint provides easier access to the higher frets, and the 5-piece jatoba/bubinga neck offers a smooth and fast surface for speedy position changes. The set of Bartolini MK1 pickups deliver a versatile frequency range with maximum accuracy, while the 3-band EQ and mid frequency switch provides excellent tone shaping. This particular bass has a small scuff in the finish on the edge of the treble side horn, a scuff in the finish on the side of the treble side waist, and a small scuff on the side edge of the headstock face. Part Number: TRBX505 TBN. 5 strings version of TRBX500 series TRBX500 has a simple brief – tone. Mahogany Body. Maple/ Mahogany 5pc Neck with Rosewood Fretboard. No RMA needed! • UPC: 885978650590. The four-saddle Fender HiMass „ bridge improves every note's sustain and resonance, while enhancing the attack for lively tone that lets your sonic personality shine through. The alder body bears a durable gloss polyester finish that looks great under the spotlight while being tough enough to shrug off the abuse of gigging and traveling. You are looking at an etched guitar pick necklace with a Bass Clef on it. Pick is then coated with a layer of water-based acrylic sealer and a coating of wax on top of that. • UPC: 717669633653. Designed for the man who has held down the low end for Guns N' Roses, Velvet Revolver, Jane's Addiction and many others, the Duff McKagan Signature Bass is rock n' roll. • Body: Alder. Its streamlined profile was designed to fit almost any corner or space lacking the desired airflow. Evening: Slowly decreases the fan speed regardless of initial fan speed setting. • UPC: 885978853939. • Fingerboard: Pau Ferro. • Fingerboard Radius: 7.25" (184.1 mm). • Color: Olympic White. • Body Shape: Jazz Bass®. • String Nut: Synthetic Bone. • Body Finish: Polyester. (Bridge Pickup), Master Tone. Fingerboard Material Fingerboard Radius Truss Rod Truss Rod Nut Jazz Bass®. Bass shown in pictures is the exact one for sale. Nut Material Nut Width. Spalted Maple Top. 45.5 Nut Width / 3.4T. 2-Ways Trussrod. 19mm Spacing. 34" Scale / 9.5" Radius. • UPC: 885978911080. • Fingerboard: Pau Ferro. There's nothing more classic than a Fender electric bass, and the Player Precision Bass is as authentic as it gets ”genuine Fender style and the rumbling, seismic sound that spawned a thousand imitations. Sold by authorized Ibanez dealer. - Ibanez under-saddle pickup. - Ibanez AEQ-SP2 preamp and tuner. 6-Way Varitone for Bass Guitar. This 6 Way Varitone is constructed on a 6 position Brass Top Alpha Rotary and features all NOS Mullard 1960’s Tropical Fish Capacitors.These capacitors are cherished by audiophiles for their sonic properties. Neck: Maple, “1963 C”. Fingerboard: Maple, 9.5” (241 mm). Position Inlays: Black Dots (Maple). Body Material: Ash. Frets: 20, Narrow Tall. The bass shown is the exact one for sale. Series: Limited Edition. New Gear: If you’re not satisfied, neither are we. It’s that simple. item# 1500000256219. Ibanez SR370E - Sapphire Blue. For 25 years the SR has given bass players a modern alternative. With its continued popularity, Ibanez is constantly endeavoring to answer the wider needs of a variety of players, at a variety of budgets. Disciple Standard by Allen Eden Guitars. Natural finish on a maple top with an alder base. Radius: 10". Finish: Natural. Scale Length: 34". Top Wood: Quilted Maple. The DMT Design humbucker provides great, full sound when plugged in. Crafted with a mahogany body, mahogany neck, and a rosewood fingerboard. Series: Resonator Bass. Pickup Bridge: Die Cast. Wood Body: Mahogany. "Matte Black" (satin black) finish. DON'T MISS OUR AMAZING SALES ON RICKENBACKER GUITARS AND BASSES! Scale Length. We know the value of personal service and encourage you to give us a call; you'll actually talk to a real person! Ibanez Premium SR1405E 5-String Bass Guitar Glacial White, FREE HARD SHELL Case! Ibanez Premium SR1405E 5-String Electric Bass Guitar Glacial White. Professional players and gear reviewers alike have been singing the praises of the SR Premium series since its introduction. The principal feature of the new bridge is the saddles can be adjusted for various string spacing. The saddles can be easily adjusted to widen or tighten the string spacing by /- 1.5mm. If you’re not satisfied, neither are we. Includes "case candy", comics, case, etc. Your bass will be exactly as described, but may not be the exact one in the photo. -We are declaration friendly so be sure to ask if you have any declaration concerns. For your consideration is this beautiful Rickenbacker 4003S electric bass guitar in the always classy and elegant "JetGlo" (Black) finish. DON'T MISS OUR AMAZING SALES ON RICKENBACKER GUITARS AND BASSES! The MTD Kingston Super is the perfect combination of beauty and brawn. How powerful, you ask?. Every bassists' personal favorite fingerboard material. That is a lot of tonal flexibility! So get yourself a MTD Kingston Super and start painting. By making playing bass easily accessible, it helped musicians find their creative voice and create new forms of music. Fingerboard Radius: 9.5" (241 mm). There's no mistaking the powerful punch of this pickup that helped shape the sound of modern music. This is a new series from G&L that we are lovin'! Made in the USA. Weighs 8.6 lbs. 1 year Free Microsoft Support. Inside the Original USB Includes full software of Office 2019 Professional Plus. This is a unique one-off custom 34" scale passive bass. The (roasted ash) body (shape) alludes to the mid 60's Teisco Del Rey, which riffed-off the earlier Fender Jazzmaster/Jaguar guitars - a very decimated guitar design and for good reason - it works! Brown Sunburst. Professional bassists in all musical genres have relied on the Fender® Jazz Bass® guitar since its 1960 introduction for its rich tone and musical versatility. Truss Rod Wrench: 3/16" "T-Style" Ball-End Hex (Allen) Wrench. The Tony Franklin Fretless Precision Bass guitar is built with input from the bassist who has played with the Firm, Whitesnake, David Gilmour, and many others. It has an alder body and a modern C-shaped maple neck with an unfinished, unfretted ebony fingerboard with side dot position markers. The custom bridge accommodates either string-through-body or top loading. Schecter Custom String-Thru-Body (or Top Load) bridge. Schecter tuners. Maple neck. Active 2-band EQ. That's the scale length of the 55-60 and the reason all Lakland 5's sound so good, so low! When you talk about clarity, tautness and tone in regards to the low B, you're talking about our passion! Bridge: Lakland Dual Access. Model # 0197102721. Fingerboard Maple. Truss Rods Dual-Action. Neck Material Maple. Body Shape Jazz Bass®. String Nut Bone. Pickup Switching 2-Way Mini Toggle Switch for Active/Passive Mode. Scale Length 34" (864 mm). 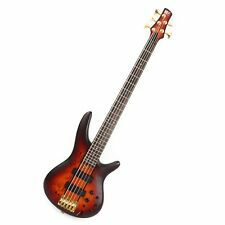 Ibanez 5 string bass. Lightweight but with excellent sustain characteristics. Minor blemishes Looks and Plays Beautifully. New Strings comes with Hard Shell Case $450.00 Plus shipping! The exclusive Deluxe PJ Bass has a Precision Bass body with the neck of a '70s Jazz Bass. With this combo you get the best of both worlds. Precision Bass body with Maple '70s Jazz Bass neck. Fender high mass bass bridge. The Swamp Ash body and Poplar Burl top with Maple center is for those who like classic tone with modern attack. Face Wood: Poplar Burl. The Music Farm is an Authorized Dean Dealer. The guitar pictured is the actual guitar you will receive! Bass Bridges. Guitar Bridges. String Guides. Italia Guitars: Inspired by the Sixties with 21st Century technologies. The coolest looking guitars that play and sound great! Looking cool and sounding hot are what these guitars are all about! The LTD RB-1004 electric bass rocks a swamp ash body, burled maple solid top, a thin U-shape maple/walnut neck, 34" scale and 22 extra-jumbo frets on a maple fingerboard. And an Aguilar AG 4J-­HC bridge pickup & AG 4P-60 neck pickup push all your earth-rumbling notes down the signal path. Italia Mondial Classic Bass. Black “Tuxedo”. and Piezo Bridge Pickup. with Logo Gig Bag. original Res-O-Glass model. Caveat emptor.